An air-conditioning system provides cooling, ventilation, humidity control and even heating (if using a Heat Pump) for a home. W. H. Carrier invented it in 1902, and we have led the market ever since. We offer the highest efficiency in central air conditioning you can buy, and with our Puron® Refrigerant—an environmentally sound refrigerant designed not to harm the earth’s ozone layer—complete comfort does not harm the world around you. When comparing different systems, always look for high Seasonal Energy Efficiency Ratios (SEER), which measure the cooling efficiency of an air-conditioner, but also for quiet operation and ease of use—you’ll be glad you did on those hot summer nights. Want to know more? Contact ACE Plumbing & Heating and get all the information you need about Carrier’s array of cooling systems for homes of any size. We're not the only ones that think highly of this unit. It's earned the ENERGY STAR® Most Efficient 2012 designation (select sizes) along with applause from Consumer's Digest as a Best Buy® winner. It's easy to understand why. 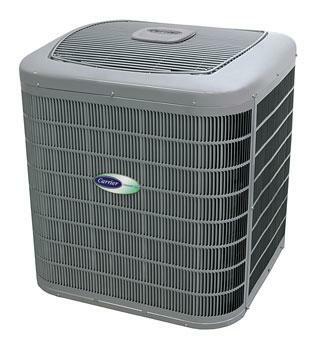 This model is the quietest, most efficient air conditioner we make for starters. Add to that the fact that its two-stage compressor can make a real comfort difference when it comes to managing indoor humidity. And if you want the ultimate in comfort, make sure you combine the 24ANB1 with an Infinity indoor unit featuring a comfort-inducing variable-speed blower motor and manage it all with an Infinity control. It's the best way to assure you get the highest level of efficiency and cool comfort. Northern climates with less humid, milder summers may not call for the highest degree of efficiency. This model lets you enjoy the benefits of an Infinity system with ENERGY STAR®qualified cooling efficiency and quiet operation.